When it comes to harming animals, one of the most important things we as individuals have control over is our own diet. By transitioning to a vegan, or plant-based diet (with no meat, dairy, eggs, or honey), we are making a compassionate choice that minimizes the amount of suffering experienced by other beings and improves our health and that of our planet. Much like dharma practice, this transition can be seen as a process, beginning with an intent and then taking actions to move us further along the path. We at DVA have found that while many people would like to make this transition, they often have many questions, such as how to begin, or how to make sure they’re satisfying all of their nutritional needs. We have learned through experience that if people don’t approach this transition wisely, it’s easy to return to old, familiar habits. In order to provide both practical guidance and moral support for those ready to make this transition, DVA has instituted a vegan mentoring program. Under the program, experts in vegan diet and nutrition will be available to answer questions and to personally assist anyone interested in exploring this path. Why is a plant-based diet an important part of Buddhist practice? The practices which turn sentient animals into commodities to be used for their flesh (meat) and secretions (dairy and eggs) are cruel beyond imagination. They involve intensive confinement, the complete denial of animals’ natural physical and social needs, painful mutilations, and the terror and pain of slaughter itself. Worldwide, 48 billion land animals are killed annually for food, along with an estimated 14 billion aquatic animals. This cruel system can only continue if there are consumers demanding animal products by purchasing them. When we adopt a plant-based diet, we are no longer paying others to torture and kill animals. The raising of livestock for our dinner table causes 30% more global warming than all of the cars, trucks, airplanes, ships and trains in the world . . . combined. Water use is also much greater in growing animal food versus plant food, and a plant-based diet is found to reduce water consumption by 54%. Animal manure is a powerful contaminant of water, contributing greatly to water pollution. Additionally, more energy is needed to produce animal food, energy that could go into feeding more hungry people. Deforestation is also an enormous outcome of animal agriculture, and in the Amazon rainforest alone, 88% of the land cleared from the rainforest has been used for grazing. Diet is the most powerful pro-active tool available to all of us to ward off disease and sickness. Consistently, nutrition studies worldwide recommend that all people emphasize plant foods in their diets, due to the abundance of antioxidants, phytochemicals and fiber only found in plants, not animals. People who eat the most plant-based foods tend to be the healthiest, avoiding a number of modern chronic diseases. Those who eat plant-rich diets experience lower rates of cancer, heart disease, stroke, diabetes, osteoporosis, Alzheimer’s disease, obesity, and kidney stones. Heart disease, diabetes and obesity can even be reversed if one adopts a completely healthy plant-based diet. One-on-one mentoring via phone, email, Skype, Google Hangout, etc. for those who would like to have someone experienced support them through the transition to a plant-based diet. Information sheets about plant-based nutrition, optimal health as a vegan, the practical aspects of shopping, stocking your kitchen, tips to ease the transition, recipes and resources to read and view. Videos which demonstrate basic cooking techniques and how to make your own plant-based staples, including cheese! Please continue to check back for information and updates about this emerging DVA service. Sherry received her certification as a Nutrition Consultant from Bauman College of Holistic Nutrition. She also completed Dr. T. Colin Campbell’s course in plant-based nutrition through the Center for Nutrition Studies. She is a Buddhist practitioner in the Plum Village tradition of Zen Monk Thich Nhat Hanh, has followed a vegan diet since 2007, and is the leader of the DVA Chapter in Chico, California. Enrolling in this program is fast and easy. First, if you haven’t already joined DVA, please become a member (it’s free). Then just email us at friends@dharmavoicesforanimals.org with your name and contact information, and we will assign either the Venerable, Sherry, or Marge as your mentor. Like all our services, it is offered at no charge. There are plenty of delicious dishes that you can make with veggies. How may I make the transition to veganism? I live in Chicago and usually only have access to fast food places. I am also on a limited income. I have tried and failed in the past. There is a wonderful website called “Plant Based on a Budget” (www.plantbasedonabudget.com) that has a ton of recipes and suggestions for tasty, nutritious vegan foods that are simple, economical, and based on commonly available foods. Maybe there is something there that would be of help. Animals are like my parents. Living from vow has helped me. 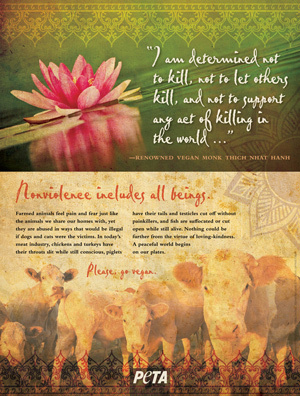 When we vow, even for one day to eat in a non-harming way, that vow is easy to keep. Then as you grow on the path of compassion, increase the vow to 2 days & longer. As you are able to keep the vow, you know the good feeling of ahimsa and will not want to return to a diet of harm. Any step away from causing suffering is a big step. Blessings to all who try for to try is to succeed. Happiness to ALL! What supplements are recommended for dogs on a vegan diet? I am transitioning my medium-to-large to a vegetarian diet (natural balance brand) but wonder if I should start providing any supplements. Books & info on this seem really limited.